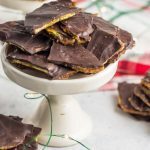 Made with just five ingredients, this paleo Christmas crack is a cleaner version of the traditional chocolate toffee saltines we all know and love during the holidays. 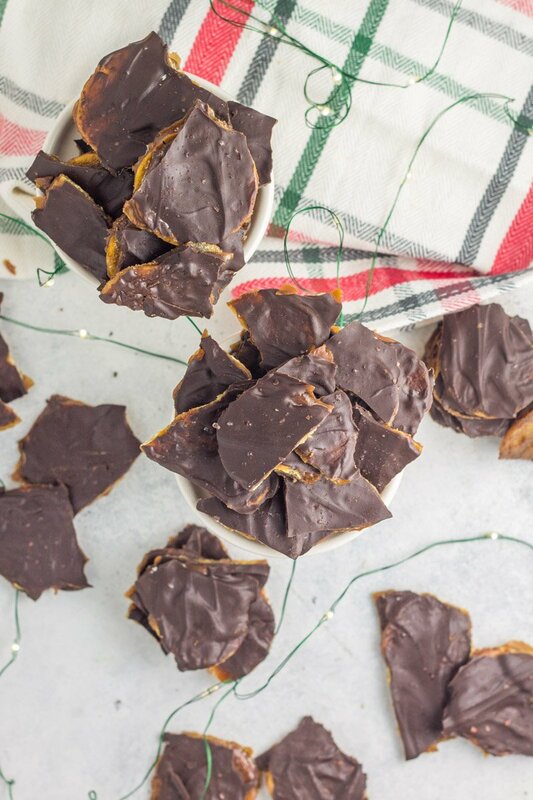 Sweet, chocoately, and crunchy – you will love every decadent bite, and may not want to share this holiday season. These are the perfect dairy free, grain free treat to enjoy! This recipe almost didn’t happen. And it would have been a shame to the entire WORLD. You know those ‘chance’ things that almost didn’t happen, but they DID happen, and it changed your life forever? Hypothetically speaking, if your job is a food blogger and you fail epically at a recipe, and the love of your life might kill you for the massive brownish/black spot permanently stained on your concrete patio, and the baby(ies) finally went down for the night JUST as the fire alarm start blaring…it’s an victory of epic proportions when you finally nail the recipe you weren’t sure was possible. Ok so the story above is true. Yeah guys, I ALMOST burned the house down attempting this not once, not twice, but three times. Note – do not burn sugar. It will fill your house with black smoke, and when you frantically open the patio in a swift attempt to stop the smoke from infiltrating your kids’ rooms, the pot of liquid sugar WILL boil over and splat all over the concrete. Making for a fun 9pm outdoor scrubbing session in November. So you can imagine my sheer delight when I figured out the perfect combination of steps to nail this paleo Christmas crack recipe. One taste, and I was hooked. It’s better than seeing fake Santa at the mall when you’re 6 years old. Hands down. 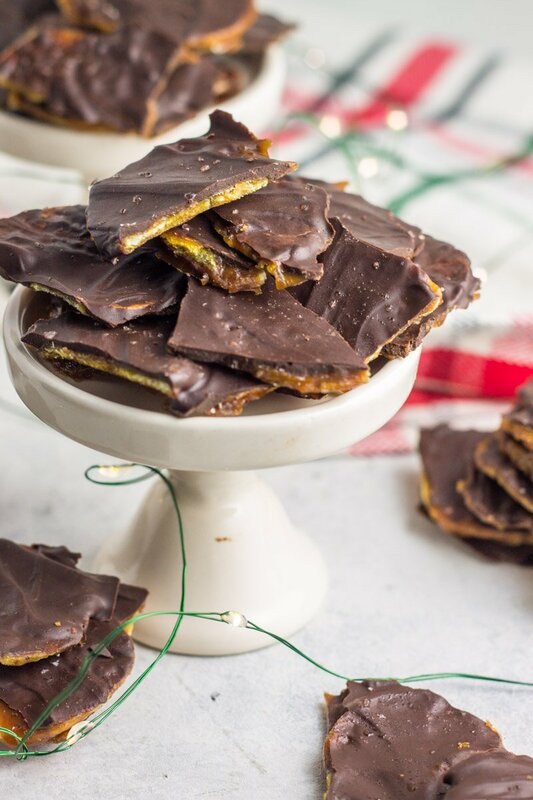 Not let’s talk about ‘Christmas crack’ – otherwise known as saltine toffee. Traditionally made with saltines, butter, brown sugar, and chocolate. 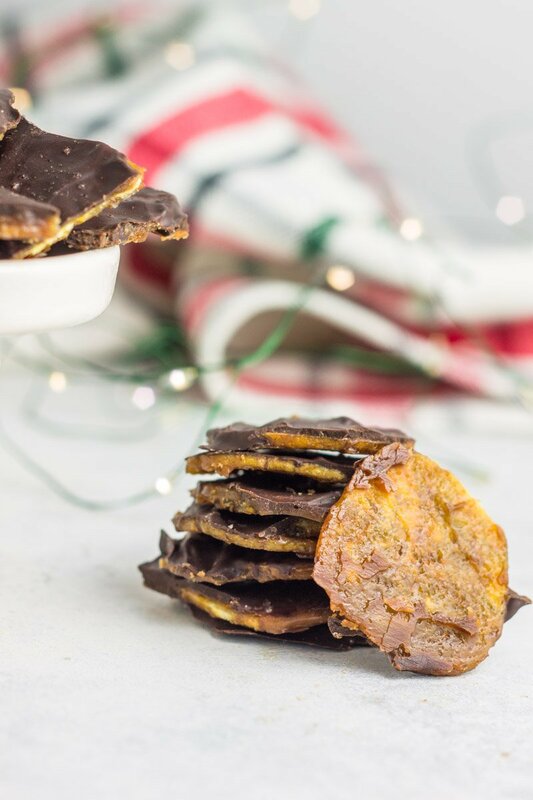 But this version is made just five simple, paleo ingredients: plantain chips, ghee, coconut oil, coconut sugar, and of course, chocolate. And it’s better than the original – pinky promise ( I wouldn’t lie – the creepy elves are watching). 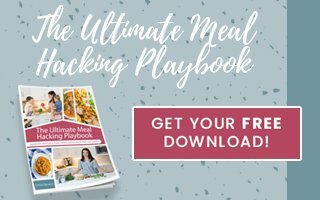 If you’re trying to make healthier choices this holiday season, or your determined to keep it paleo, but miss the traditional sweet treats – I got you covered girlfriend! Make sure to read the directions carefully, since the caramel sauce can be pretty finicky (and quick to burn if you aren’t careful). The payoff though – oh that sweet payoff is so worth it. In an attempt to be 110% transparent, I ate this whole batch myself. I know it isn’t very Christmasy of me to not share, but I just couldn’t stop. If you make one treat this holiday season, this has to be it! Looking for other festive yummies to make that are gluten free and dairy free? Try these soft & chewy paleo gingerbread cookies, peppermint almond joy quinoa balls, or these chocolate chia pecan pie parfaits. Place the pan into the refrigerator to chill. Once chilled and the chocolate has hardened, gently break off pieces to desired size and serve! Enjoy Life is a great brand for dairy free chocolate chips! My personal favorite is the Enjoy chocolate chips! Can hardly wait to try this chocolate crack! Did you make your own plantain chips or use store bought? This looks amazing! Definitely store bought! I get mine at Trader Joe’s. Do you have a brand of plantain chips you prefer? Or did you make your own? Can’t wait to try this. 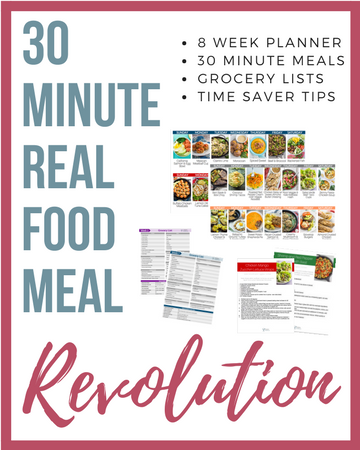 I get mine from Trader Joe’s but honestly, most brands will work for this recipe! I do not make my own for this simply because it’s really hard to get them crispy enough. Store bought is best! Are the plantain chips packaged or fresh plantains cut into chips? I can’t wait to make this! I would definitely use store-bought/packaged plantain chips! I presume these are the non-sweet plantain chips from TJs? You are a genius!!! 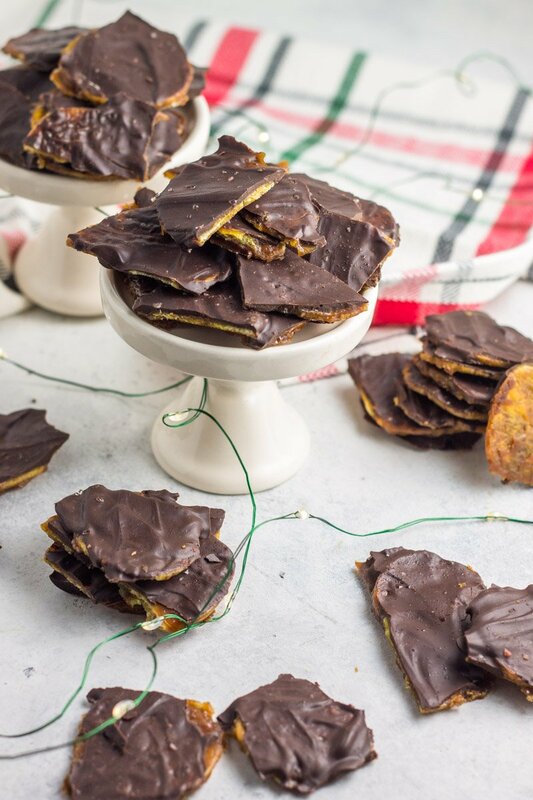 I’d never had Christmas crack until my SIL made it a few years ago, I started making it every year except for last when we moved to more paleo eating and I was miserable and pregnant🙁so excited to try this recipe! Be careful Amanda, it’s highly addicting! Would this keep in the freezer? I haven’t tried (never lasts that long) but my guess is it would! I just made this and WOW it’s addicting!!! All of your trials and errors were SO worth it because this stuff is to die for! Thank you for a great recipe!!! So glad you loved it Morgan! I think it’s totally addicting too. My pleasure Morgan! So glad you liked it! Help!!! The oil and ghee separated from the sugar and I couldn’t get it to blend back together. Any suggestions? You definitely have to whisk vigorously. It will separate at first, but if you keep whisking whisking whisking, it will all combine together. Your arm might feel like it’s going to fall off, but it’s worth it! Oh My Goodness! My husband and I can not stay out of these! Mine were not as pretty as yours were, I do not use a microwave so I had to stove top my chocolate, but its worth everybit of paitence it took! Love Love Love! Is there something I could use rather than ghee? I was told that is not paleo, but really want to make this.